The 2019 NSCRO Women’s National Championships will be held April 27 - 28 at Founders Field in Cheswick, PA.
Games will be played on two fields concurrently. All games on Field 1 will be live-streamed on the NSCRO Women’s YouTube Channel: https://www.youtube.com/NSCROWomensRugby. The match schedule is as follows. A hard copy can be downloaded here. 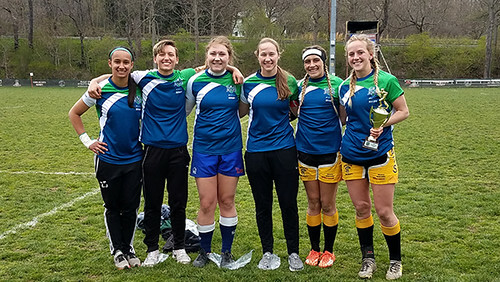 On 28 & 29 April 2018, 16 NSCRO women's teams from around the country descended at Founders Field in Cheswick, PA for the NSCRO Women's 7s National Championship. The weather for the entire weekend was cold, damp and windy but these women came to Founders Field for a chance to test their skills and strength and show the nation who is the best NSCRO Women's 7s team. The 16 teams were seeded into four pools of four teams with the top eight after pool play moving forward to the knockout rounds. Wayne State College (Nebraska) beat Lee University (Tennessee) by a score of 24-5 to add their fifth NSCRO Women’s 7’s National Championship title. Wayne State opened up with a convincing 31-7 win against California University of Pennsylvania and followed this with a 25-5 win over the University of Scranton. The University of Rochester finished 11th last year and they were out to prove that they could do better this year. They struggled a little in their first game against Scranton 15–7 but followed this with a solid win against Cal U, 24-10. The last round of games in Pool A pitted Wayne State against Rochester for the top spot with Wayne State winning by a score of 26-10. Cal U won the final game of the pool over Scranton by a score of 17-15. Perennial third place finisher Lee University were matched up against the University of Findlay in the opening game and ran out 20-5 winners. Endicott College struggled last year but looked good in their opening game with a 15-5 win over Widener University. In the second round of games, Lee struggled in a 27-19 win over Widener while Endicott looked comfortable in a 28-5 win over Findlay. In the game of the two undefeated teams, it was Lee who came out on top with three tries from Hailey Thompson taking them to a 24-12 victory over Endicott. Widener took the final game of the pool by a score of 29-19 over Findlay. The opening game of Pool C produced the first shock result of the weekend. Colgate University, last year's National Champions, seemed to have a comfortable lead late in their game against newcomer Occidental College only to have Oxy come back and score two tries in the final minutes to win the game 17-15. Colgate bounced back in their second game with a 36-0 win over Fairmont State University. York College of Pennsylvania looked good in their opening games as they beat Fairmont by a score of 48-0 and Occidental by a score of 34-5. York put up big numbers and they proved too strong for Colgate. York’s 33-0 win meant they had the best points differential of any team in pool play, and it also relegated Colgate to the consolation bracket. Occidental’s 17-0 win over Fairmont gave the newcomers from California the second spot in the pool. Simpson College opened up with a 38-0 win against Ursinus College. The team from Iowa had previously finished 4th, 5th, and 6th, and their goal was to finally finish in the top three. In another surprise result, newcomer Denison University knocked off last year's third place team, Colorado College, in a tight 10-5 game. Denison looked to have their second round game with Simpson locked up with 17-5 lead and only fifty seconds left in regulation time, only to have Simpson pull a rabbit out of a hat with two quick tries to tie the game 17-17. In their second pool game, Colorado College bounced back to beat Ursinus by a score of 29-10. The third round games saw Simpson win 32-10 against Colorado College and Dension winning over Ursinus 24-5. Simpson pipped Dension for the top spot in the pool with a better point differential. At the end of pool play it was Wayne, Lee, York and Simpson winning the pools with Rochester, Endicott, Occidental, Dension joining them in the Championship Quarterfinals. Wayne State met Denison in the first of the quarter final games with Wayne State winning by a score of 44-0. Simpson looked good in their 30-14 win over Rochester. York prevailed over Endicott, 30-12 and looked very strong in their 46 - 0 win over Occidental. California University of PA's 24-5 win over Ursinus set them up for their best finish in three visits to the National Championships. Colorado College defeated Scranton 22-7, Widener beat Fairmont 33-0, and in a close game, Findlay edged out Colgate 15-12. The weather turned colder on Sunday and the day started with a few snow flakes in the air. The first semi final pitted two teams with a history of solid finishes in the competition. Lee finished third for the last two years and Simpson had finished fourth, fifth and sixth in previous trips to the 7’s Nationals. Simpson College drew first blood with short range try from a penalty but Lee came back with two tries from Hailey Thompson. The first half ended with Allyson Frank stealing a Simpson lineout and diving over to score from five meters out. Half time score Lee 19 Simpson 5. Lee dominated the second half and two tries from Olivia Jones and another from Madison Lowe took the final score to Lee 36 Simpson 5. The second of the semi finals saw two teams with competed in the semi finals of the NSCRO 15’s National Championship in December. Wayne progressed by playing a game that utilized their superior passing skills and the experience of their 4/5 combination while York College were playing the more expansive game and had outscored the opposition by 145-17 through the quarter finals. Wayne got on the board first when they capitalized on turnover ball. Two more tries from Wayne took the score to 19-0 at the half. York struggled to as Wayne pressed hard in defense and this shut down York’s ability to get the ball wide to their speed. Wayne scored from the first play of the second half to end all hope of a York comeback and another three tries stretched the final score to Wayne 38 York 0. Rochester finished in fifth with a solid win over Endicott by a score of 31-12. The game was a closely fought affair with the difference being three long runs for tries by Rochester. This was a solid result for both teams who moved up respectively from 11th and 13th last year. Simpson College and York College had played stylistically similar games all weekend and it was going to be a battle of two teams favoring speed over size. Simpson scored first when they turned over a York ball at a breakdown and strung together twelve passes through several phases to take the early lead, 5-0. York answered immediately with a converted try but another simple error allowed Simpson to regain possession and string together ten passes for second try. Simpson started to capitalize on York’s inexperience and scored tries as a direct result of a quick throw in, from winning their own kick off, and again turning the ball over at the breakdown, to set a halftime lead with a score of Simpson 25, York 7. The second half saw York rally with two well-worked tries to narrow the score to 25-17 only to give up a simple try that stretched the Simpson lead back out to 32-17. York finished with a try on the last play of the game but in the end, it was Simpson's experience that took them to the 32-22 win for the third place finish. Wayne State was looking to win their fourth title in five years and Lee had finished third in both of the last two 7’s championships and were assured of their highest finish in the event. Wayne State made it to the final on the continuity of their offense but it was their defense that was on show in the final match. The first half saw Lee with the majority of the possession but they were not allowed to settle into any pattern as the Wayne hounded the ball carriers and shut down all of Lee’s attacking options. Wayne scored two tries in the last ninety seconds of the half with the first coming from a well-worked penalty play with Leanna Rosberg throwing a little dummy pass and slide between two defenders to go in for a try. On the last play of the half, Brooke Hoesing took advantage of a large gap in the Lee defense to touch down to make it Wayne 10 Lee 0. The second half opened much like the first with Lee having the majority of the possession but unable to capitalize on a series of penalties against Wayne State. On their first possession, Wayne State moved the ball across the field and then came back to the forwards where Turner MacPhee was able to outpace the Lee forwards for a try under the posts that Kelcey Stutzman converted. On the ensuing kickoff, Ann Fleecs ripped the ball from the hands of a Lee player and two passes saw Hoesing go through the heart of the Lee defense for her second try of the game. Stutzman added the conversion to take the score to 24-0. With the outcome inevitable, both teams brought in players off the bench. On the last play of the championship, Lee moved the ball wide to Shae Ferguson who beat several players down the sideline to score. 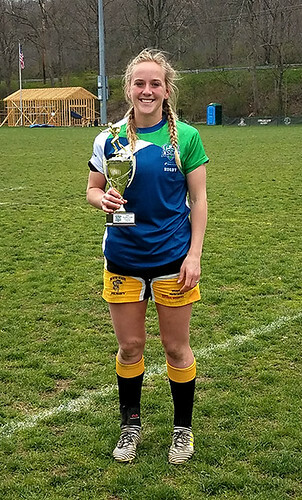 The conversion was missed, the ref blew for full time, and Wayne State had won their fourth NSCRO Women’s 7’s National Championship in five years by a score of 24-5. Matches on Field 1 were live-streamed, courtesy of the Pittsburgh Harlequins RFA. To watch the matches from the 2018 National Championship, go to our YouTube channel.